Miscellaneous. Watercolour with added bodycolour. Annotated (bottom left) "Sketch off Cowes. 8th Aug 1909" and signed E de Martino. Verso, in Martino's own hand (Italian) is his visiting card: "A record of the Naval Review at Spithead 2 Aug 1909". 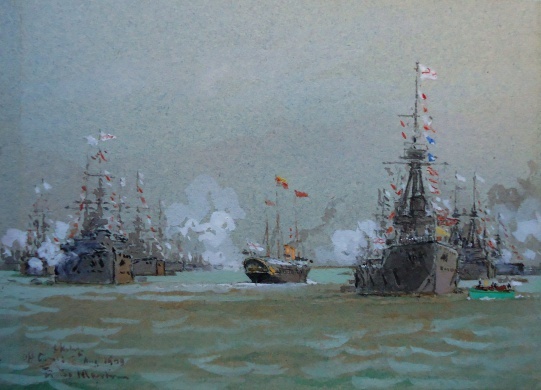 Under the superintendence of the Commander-in-Chief Portsmouth, Admiral Sir Arthur Fanshawe KCB, the two divisions of the Home Fleet and Atlantic Fleet arrived in the Solent on the afternoon of 31 July 1909 to take part in the Royal review that was held on the following Saturday. As the combined fleets approached Spithead the ships divided up into 6 lines to take up their anchor berths. This was to be the first review at which battle cruisers (then known as 'dreadnought cruisers’) made their appearance, the original ship of the type, INDOMITABLE, having in the previous year made her record run to Canada and back with HM The King embarked. At Spithead that afternoon there were in total 27 battleships and dreadnought cruisers, 16 armoured cruisers, 8 protected cruisers, 48 destroyers and 42 submarines  indicating the high value finally placed by the Admiralty on this new type of warship, the submarine. Despite being the last major maritime nation in the world to adopt the submarine, by the time of this review the Royal Navy was leading the world in the development of this weapon. Edoardo de Martino's watercolour shows the scene on the day of the review. In the centre of the painting is HM Yacht VICTORIA & ALBERT (Rear Admiral Sir Colin Keppel KCVO CB DSO ADC, In Command of His Majesty’s Yachts) wearing the Standard of HM The King who was accompanied by HM The Queen and TRHs The Prince and Princess of Wales. To the right of the painting at the head of line A is the world’s first dreadnought battleship, HMS DREADNOUGHT herself. Wearing the flag of the Commander-in-Chief Home Fleet (Admiral Sir William May KCB KCVO), DREADNOUGHT (Captain Archibald Moore MVO RN) had started to transform the world’s fleets with her revolutionary features and so swift was the Royal Navy to capitalise on her attributes that less than 3 years after she first commissioned there were already a further six dreadnoughts at sea and in this review. Astern of DREADNOUGHT and showing in the watercolour are three further dreadnoughts of the 1st Division, BELLEROPHON (Captain Hugh Evan -Thomas MVO RN), SUPERB (Captain F C D Tudor RN) and TEMERAIRE (Captain A L Duff RN). At the head of Line B, to port of the Royal Yacht, are painted HMS KING EDWARD VII (Captain Osmond de B Brock RN), flagship of Vice Admiral Commanding the 2nd Division, Home Fleet, Vice Admiral Sir Archibald Berkeley Milne Bt KCVO. Astern of her are BRITANNIA (Captain Frederick Morgan MVO ADC RN), HINDUSTAN (Captain Somerset Calthorpe MVO RN), DOMINION (Captain J M de Robeck RN); and HIBERNIA (Captain James Ley RN) flying the flag of Rear Admiral James Startin. Line C, over to the left of the watercolour, is headed by HMS PRINCE of WALES (Captain Edward Phillpotts RN), Atlantic Fleet flagship of Admiral His Serene Highness Prince Louis of Battenberg. Amidst the swirling smoke of the Royal Salutes and astern of C-in-C Atlantic Fleet is HMS QUEEN (Captain David Beatty MVO DSO RN). On the extreme left at the head of Line D lies BOADICEA (Commodore in Charge First Destroyer Flotilla, Commander F M Leake RN. That evening, Saturday, the entire fleet was illuminated as it was again on Monday night when the Czar and Czarina of Russia were aboard their yacht, STANDART. Frank Watson Wood (whose paintings feature throughout this website and www.maritimeprints.com) has painted a watercolour showing the British and Russian Royal Yachts later in the following week when they were moored off the Royal Yacht Squadron as Cowes Week got underway.